True North, the registered non-profit company that has committed itself to getting crèches in underprivileged areas registered and up to code, on the 9th November held the official opening function of the Masikhule Educare crèche in Vrygrond, run by Miriam Solani. The new 200m² building replaced the original informal care centre with a well-insulated, light and airy crèche which cares for 53 children between the ages of 18 months and six years. Vicky Kumm, True North’s CEO, announced in the press recently that they were committed to improving the standards in as many of the 1 700 unregistered crèches in the Western Cape as possible. Due to the success and tremendous support that they received from their sponsors and donors at Masikhule, they have been able to start the planning (quicker than originally anticipated) on their next project, also in Vrygrond. This building will be approximately four times the size of the Masikhule crèche and, it is hoped, will be able to accommodate 200 children. The erf, which has been allotted to them by the Vrygrond Trust, is 1 300m², which allows this crèche to have a large garden and treed play area for the children, something that is crucial to proper early childhood development. “There is ongoing sponsorship needed with projects such as these and although we get constant assistance from many, we ask those who have the resources to donate to this project. 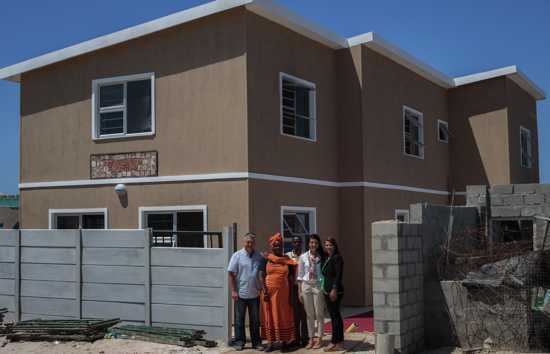 RED-i (Real Estate Development Interactive) one of the original sponsors of the True North initiatives have said they are extremely excited to see the completion of this new crèche. They will continue their support and sponsorship of True North as they see their contribution is making a tangible difference to people’s lives in both education and infrastructure,” said Kumm. If any business or individual would like to make a financial contribution towards the next crèche, please call Vicky Kumm directly on 082 902 2227 or visit their website www.true-north.co.za.